Usually when an athlete drops down and does some push-ups, it’s because they committed some sort of mistake. 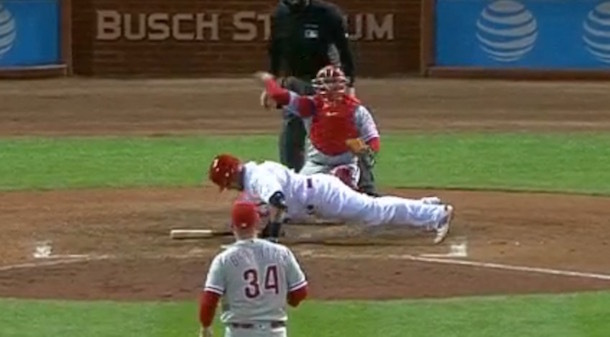 But in this instance, St. Louis Cardinals catcher Yadier Molina didn’t do anything wrong. In fact, he actually did something right when he dodged an inside fastball from Phillies pitcher Brett Oberholtzer. Apparently the extra workout didn’t tire Molina too much, because he was still able to muster a single during the at-bat, raising his batting average to .333 for the season.